NASA's mired Spirit rover remains in a nine-month slumber as it begins the eighth year of its Mars mission, but its twin, Opportunity, keeps chugging along. Researchers are crossing their fingers, but they know Spirit is in a tough spot. "The reality that we haven't heard from the rover so far, now that we're in Martian spring, it's concerning," John Callas, Mars Exploration Rover (MER) project manager at NASA's Jet Propulsion Laboratory in Pasadena, Calif., told SPACE.com. "And then each day that goes by, it's one more tick downward in our optimism for the rover." 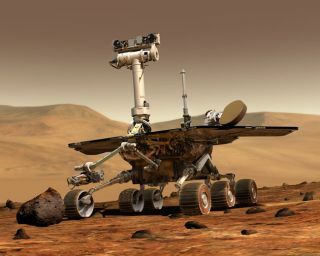 Spirit and Opportunity were originally tasked with three-month missions to look for signs of past water activity on Mars. Both rovers delivered in a big way, finding lots of evidence at their disparate landing sites that the Red Planet was once a much wetter, warmer place. In 2007, Spirit even stumbled onto evidence of hydrothermal systems on Mars. The find suggested that large amounts of energy flowed through some wet environments in the ancient past, making the emergence of Martian life a likelier prospect. The Spirit rover's jammed right front wheel dug this trench, exposing silica minerals -- strong evidence of hydrothermal activity in Mars' ancient past. And the rovers just kept on going, far beyond warranty. The six-wheeled, golf-cart-size robots were each designed to log just 0.6 mile (1 kilometer). But between them, the rovers had traveled 21.3 miles (34.2 km) on the Martian surface as of late December, researchers said. Opportunity keeps adding to that total with every passing day. But it is unlikely Spirit ever will, even if it wakes up. The failure of its right front wheel in 2006 compromised Spirit's mobility, and it got mired in soft sand in May 2009. The trapped Spirit went silent 10 months later, after failing to maneuver into a position that would slant its solar panels toward the sun over the course of the Martian winter. The sun is strengthening now at Spirit's locale and will reach peak power this coming March. So mission scientists still hold out hope that Spirit will rouse itself. Spirit now has two wonky wheels, so there's little chance the rover will be able to extricate itself from its sand bog, researchers have said. But it could still do some quality science if it woke up. Mission scientists, for example, could track Spirit's radio signal and use the signal's movement as a proxy for the rotation of Mars. They thus might be able determine how big Mars' core is and whether it's liquid or solid, Callas said. So researchers are keeping close tabs on the slumbering rover, checking it daily. They're hopeful, if not necessarily confident, that the rover will wake up. "It's total guesswork," MER deputy principal investigator Ray Arvidson, of Washington University in St. Louis, told SPACE.com. "People who've bet against it have always lost so far. But it's your great granddad of rovers." Opportunity is showing some signs of age as well. Scientists are driving it backward, to distribute wear more evenly on Opportunity's gear mechanisms. And one of the five joints in its robotic arm is pretty arthritic, Callas said. But the rover keeps chugging along. Right now, it's checking out some mineral deposits at a big, fresh crater called Santa Maria. The minerals are likely to have formed in the presence of water long ago. Opportunity should finish up at Santa Maria by early February, researchers have said, and then it will resume its long trek toward the huge Endeavour crater. Endeavour is about 14 miles (22 km) wide, and Opportunity has been heading for it since August 2008. The goal is to check out some clay deposits — another sign of water activity in the ancient past — on the crater's rim. Opportunity has about 3.7 miles (6 km) to go. Opportunity isn't a speed demon — a good day of travel for the rover is about 330 feet (100 meters), researchers have said — so it won't just zip on over to Endeavour . But the rover is consistent, methodical and — as the last seven years have shown — incredibly resilient, so it would probably be unwise to bet against Opportunity at this point. "These rovers have demonstrated that there's always an exciting adventure ahead," Callas said.